During previous years this printing office in The Hague had made its mark with printed material that caught the eye thanks to the daring and innovative designs of Piet Zwart (1885-1977). Zwart, who was working for an architect’s firm at the time, had no experience whatsoever in typography (‘I did not even know what lower and upper case were’). This was exactly what enabled him to approach typography with a fresh view. 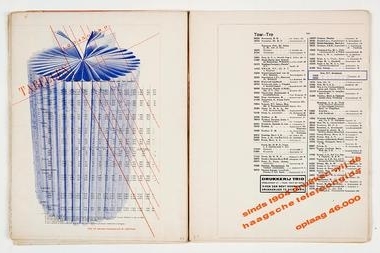 Drukkerij Trio’s good will publication was to include specimens of daring typographical design and of so-called photo-typography with multicolour printing. Piet Zwart wrote an essay for the book entitled ‘van oude tot nieuwe typografie’ [from old to new typography]. After presenting an overview of historical styles, Zwart defined the major characteristics of the new typography: its no-nonsense approach, technical precision, functionality and asymmetry. Zwart thought that a typeface should be ‘elementary’: ‘the less interesting the typeface, the more typographically usable.’ In addition he advocated the rigorous abolition of capitals. The board of management at Drukkerij Trio must have been shocked by this inspired manifesto. They had already demurred in their preface (‘We do not intend […] to make propaganda for a specific typographical concept’), but apparently this did not go far enough, because eventually it was decided to abandon the publication of the promotional gift altogether. Only proof copies of the first Dutch manifesto on the new typography, written by one of the best known Dutch designers of all time, were made at Drukkerij Trio. Of this proof only a few copies have survived. Two of these proofs, taken at different stages, ended up in the Museum Meermanno in The Hague.